Brighten up your night with LED Concepts® Pack of 2 Plug-In LED Night Lights! These night lights offer a continuous glow for added safety, security, and convenience. All you have to do is plug-in and the night light will automatically turn at night or when you turn off the lights! Navigate through the dark with ease and a beautifully warm glowing light. The space-saving flat panel design is perfect for any size room and can easily be plugged in to any standard outlet. These ultra-slim night lights also feature a cool-touch design so that it can be conveniently relocated at any time. 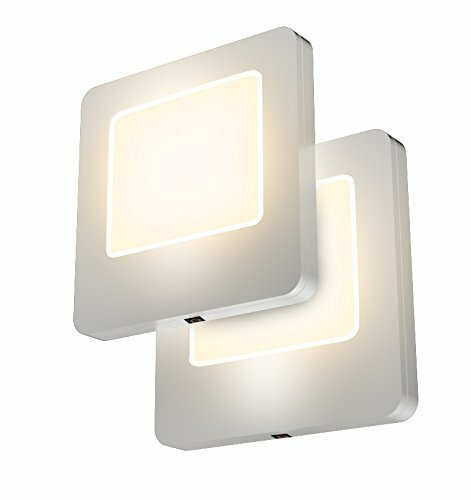 The continuous warm white light adds ambient lighting to any room! These lights are easy on your eyes without disturbing your sleep throughout the night. It is also great for children's bedroom, living rooms, hallways, entrance ways, and more. They are sourced by LED lighting which illuminates when energized and never needs bulb or battery replacement. That means that these amazing lights are also an extreme energy saver costing about a few pennies per year! So what are you waiting for; start lighting up your nights! LED night lights measure approximately 3"X ¾"X 3"